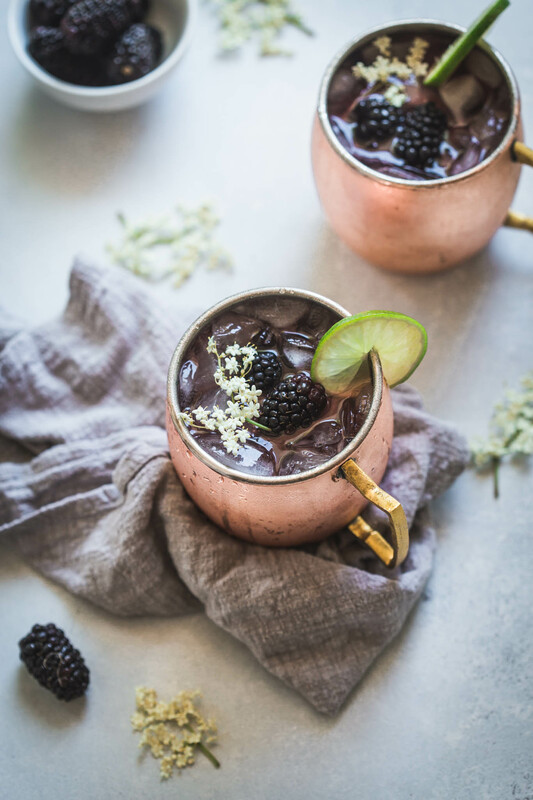 Try this Blackberry Moscow Mule with Elderflower for a delicious twist on the traditional Moscow Mule cocktail. Fresh blackberries, lime juice, vodka and ginger beer combine with the essence of elderflower in this delicious and refreshing icy cocktail. 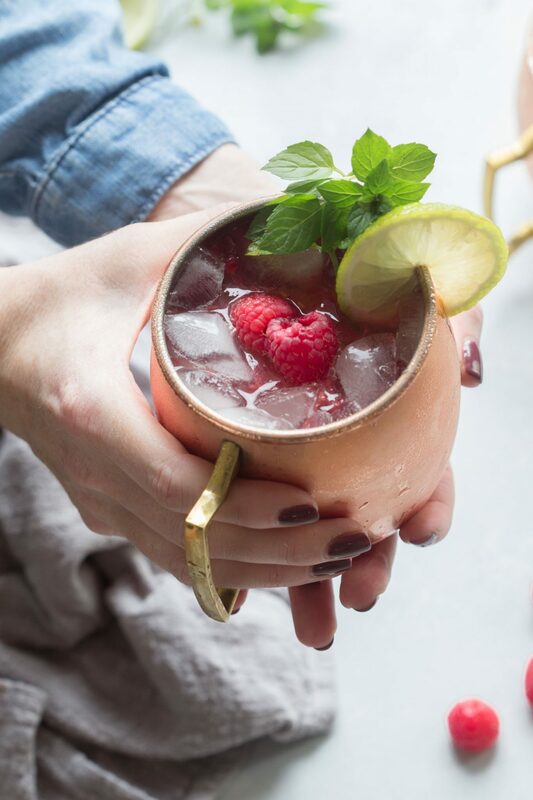 Who doesn’t love a moscow mule cocktail? They are seriously the most refreshing beverage – Perfect for warm summer evenings on the patio. 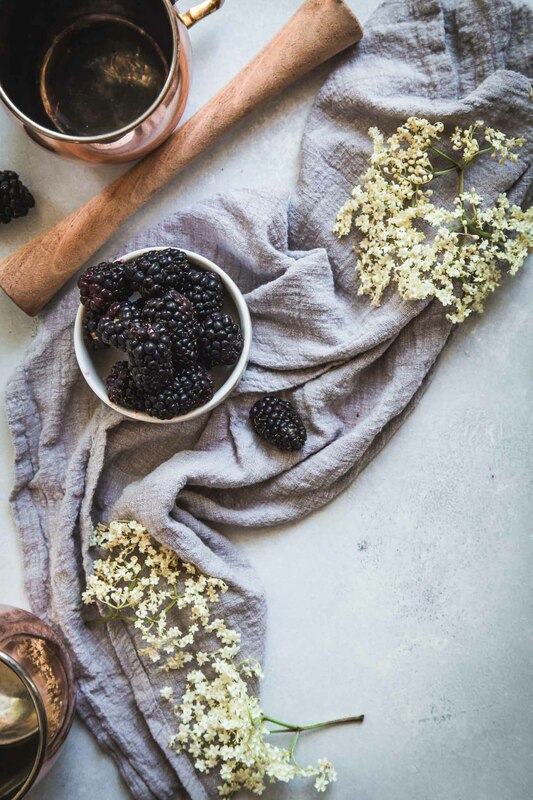 Today I’m putting a twist on the traditional moscow mule by throwing some fresh blackberries and elderflower into the mix. I just so happened to be at the Farmer’s Market when I spotted a booth that not only had some gorgeous Oregon blackberries on hand but also these gorgeous fresh elderflower blossoms. Here in Portland, we are lucky enough to have the most plump, juicy and delightfully purple Oregon blackberries. At our beach house, we have a couple blackberry bushes growing in the yard, but our berries haven’t come in yet for the year, so I was happy to find them at the market. The elderflowers, on the other hand were new to me. 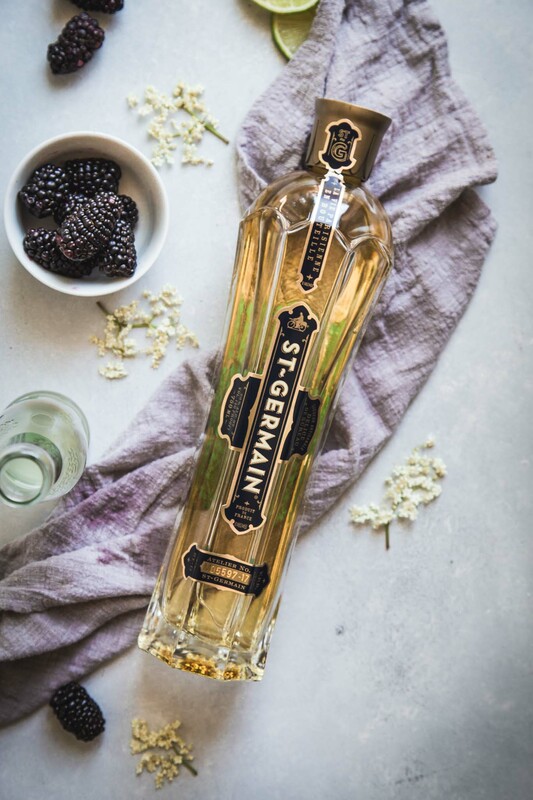 I’ve only experienced elderflowers once… and in the form of St. Germain, an elderflower liqueur that is widely available. I attended a brunch at my friend Lena’s house and she was offering up flutes of bubbles topped with a bit of the elderflower liqueur. They were so yummy. Elderflower has a floral, sweet, almost citrus-like quality. The blossoms are so delicate with a beautiful ivory color. 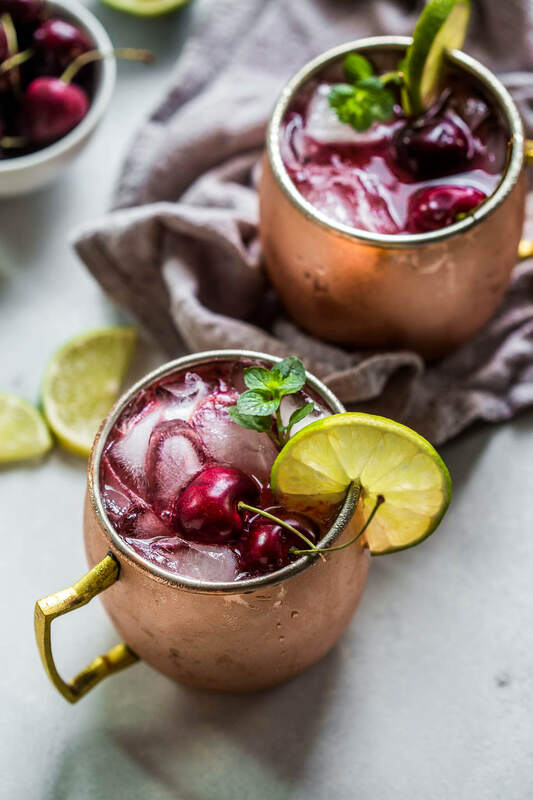 I was super excited to find them and use them to dress up my blackberry moscow mules. But, I didn’t just want to use the flowers as decoration. I also wanted their lovely flavor in these cocktails too. While you can make elderflower liqueur at home, I chose to take a shortcut by buying a bottle at the liquor store. 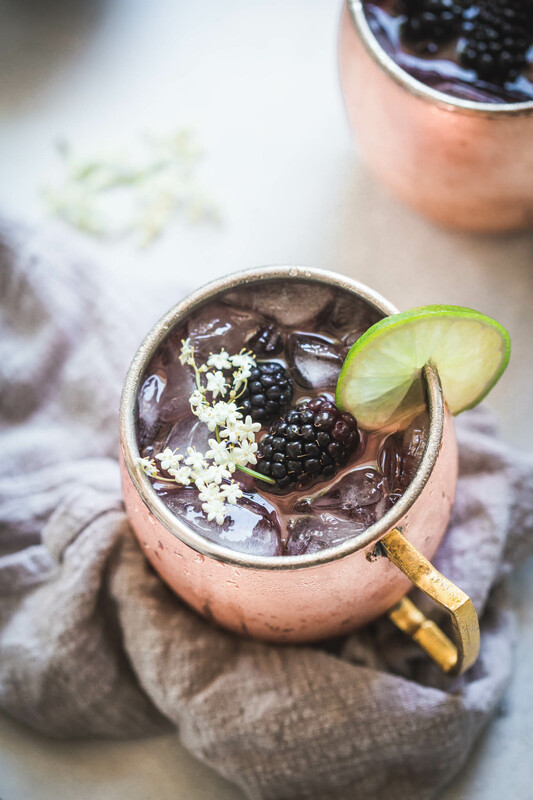 You need a LOT of elderflowers to make the liqueur, and I didn’t want to totally clear out the Farmer’s Market… Also, I wanted one of these blackberry moscow mules immediately… I wanted simple. If you’ve ever made a Moscow Mule, you know that it is a super simple recipe. There’s basically no measuring involved, no cocktail shakers needed and no fancy ingredients. 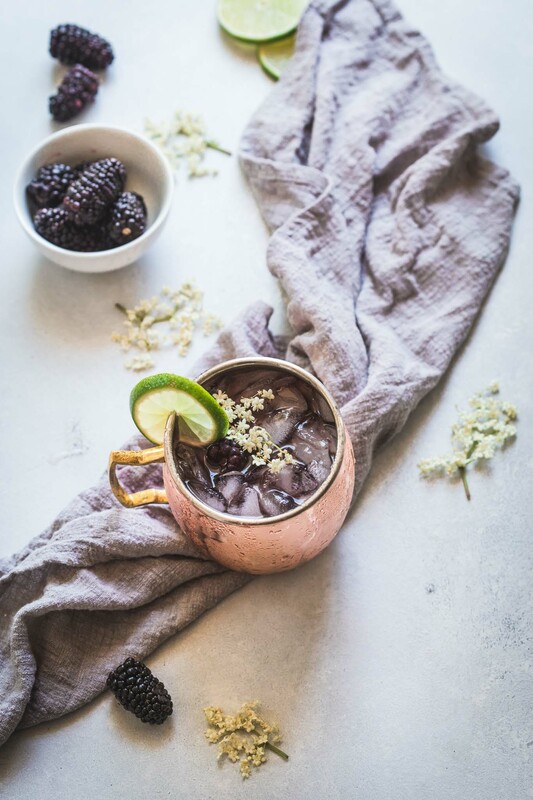 The two special items you may want for your blackberry moscow mules are a muddler and those cute copper mugs. The muddler is used for mashing the fresh blackberries, helping to release all their yummy juices. However, if you don’t have one on hand, feel free to use the handle of a wooden spoon in its place. Those copper mugs though… In my book, they’re a necessity! They’re so pretty, and the beads of water that form on them when they’re icy cold leave you refreshed just looking at them. But did you know, that the copper also serves a purpose? The cold metal does a great job of insulating your cocktail. Squeeze the juice from half a lime into your mug and add a small handful of blackberries (about 5). Muddle those together and then fill your mug with ice. Then, you’ll add in a shot of vodka and elderflower liqueur. Top the whole thing off with some ginger beer. Note: Be sure that you’re using ginger beer and not ginger ale. While it will still taste good, it will be much more sweet and the ginger flavor will not be so pronounced. 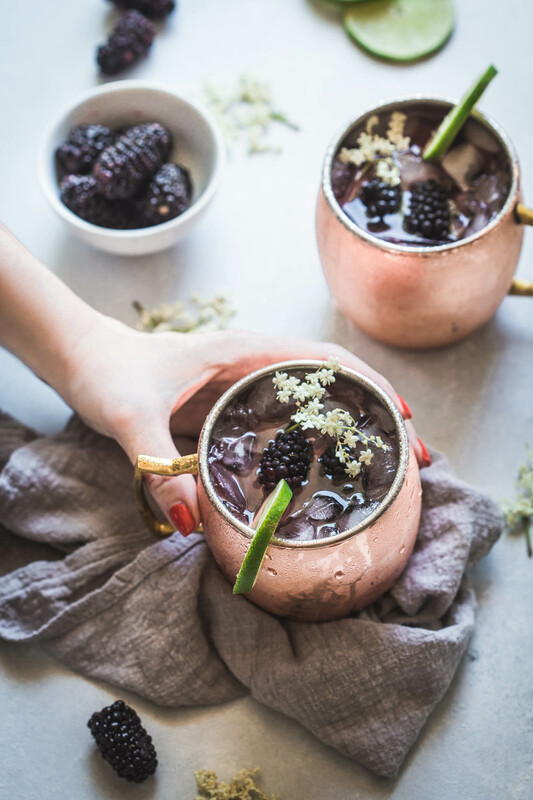 To finish off my blackberry moscow mules, I added a couple elderflower sprigs and dressed them up with lime wheels and couple more fresh blackberries. Totally optional, but so pretty! Muddle lime juice and blackberries in a copper mug. Add vodka, elderflower liqueur and ice to fill and top with ginger beer. Enjoy! 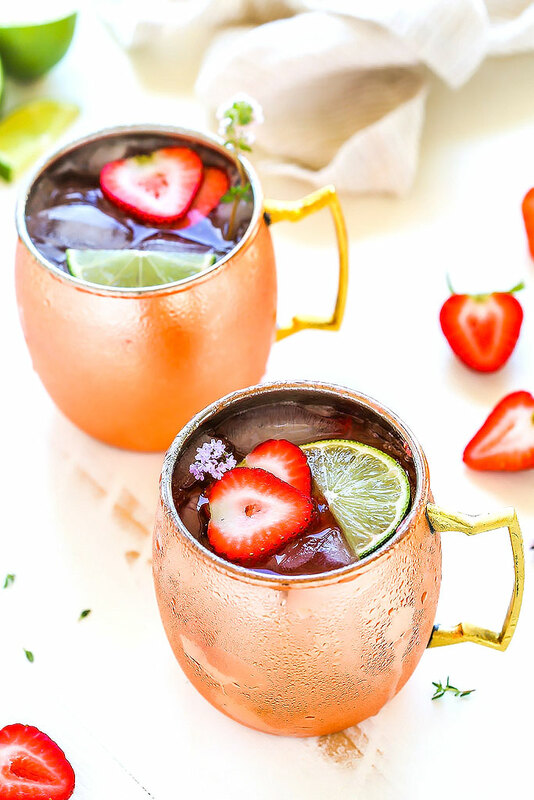 If you loved this blackberry moscow mule recipe I would appreciate it so much if you would give it a star review! Also, be sure to snap a picture of your finished cocktail and share it with me on Instagram using the hashtag #platingsandpairings. I teamed up with Oregon Berries to bring you this post. As always, all opinions are my own. This looks absolutely delicious – and pretty! 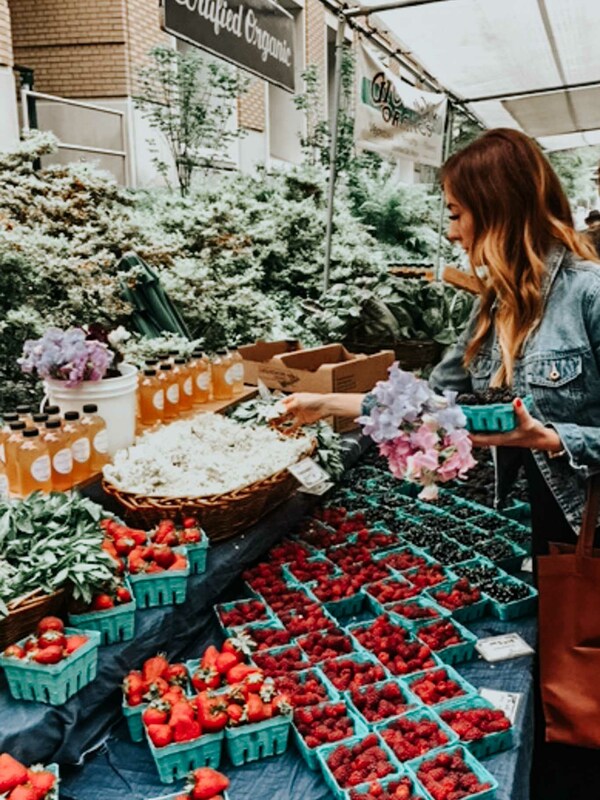 There’s so much beautiful produce at the farmer’s market right now, it’s hard not to make a show-stopper. I agree Catherine – I don’t get to the market nearly as often as I’d like but there is so much great stuff there! 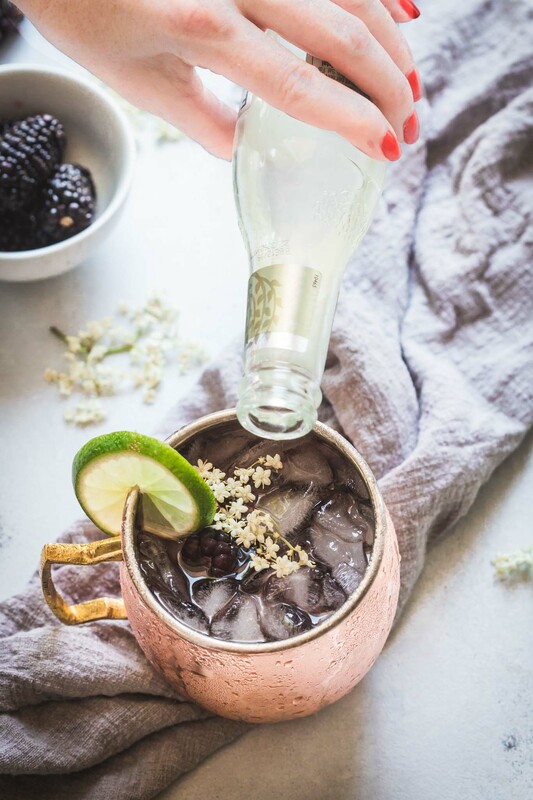 Ooo I love Moscow Mules for a refreshing beverage on hot days but never thought about adding elderflower liquor or flowers to it, but it makes it so pretty! Thanks for the idea! Of course Pech – Cheers! Cocktails with elderflower and St Germain are SO delicious. I love them! These are gorgeous! Yay for new muddlers – Cheers Hillary! It’s one of my favorite cocktails ever, can’t wait to try this recipe as well. Thanks! So glad you liked it Kelly! Eating berry fruits like blackberries may improve brain health and help prevent memory loss caused by aging. It helps in reducing cholesterol, control blood sugar levels, helps in weight loss. I love eating blackberry foods and drinks.